My students ate so many M&Ms and Skittles that their teeth turned blue. I didn’t even open the bag of peanut M&Ms. On the way home, I stopped in my little corner 7/11, where I know all the staff and they all know me dashing in to grab a box of microwave dumplings at three in the afternoon for the day meal that isn’t really breakfast, lunch, or dinner on the way to class or sometimes the night meal on my way home after nine, or the daily bottle of orange juice or cranberry juice or in pre-diluted milk tea days, milk tea. One of the cashiers was in her day clothes with her little daughter in tow, and two of the teens were manning the register in the requisite burgundy-tan shirts. I was walking back with my bottle of orange juice and noticed a white butterfly fluttering and flitting over the blue-silver tinsel garland hung from the ceiling to decorate Mother’s Day cake promotions. It was suspended in a blur of white wings looking for the heart of this long strange flower-wannabe. The tinsel threads swayed just a little as the white wings frantically beat the air around them. The little girl and I watched it weave around the shining strand and finally settle to take a deep breath on the ceiling, eyes still on the tantalizing tinsel. It was a cabbage butterfly, I think. My cousin told me that it’s a plague for Taiwanese farmers, as it hasn’t much in the way of predators. 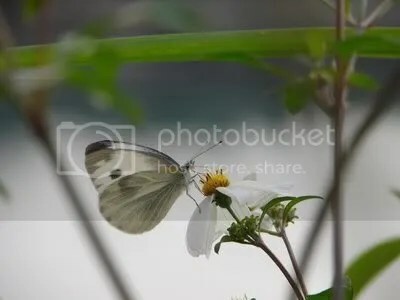 This one was happy drinking from daisies by the river in Gongguan. Anyway, the tall cashier with a smooth white forehead and curly long hair got a wooden stepping stool to stand on, her hands cupped as they tried to encircle the butterfly without hurting it. She ended up chasing it with a large translucent plastic bag to the back of the store, then a plastic basket. In the meantime, I’d checked out my bottle of vitamin C and thought I should get back, but the drama forced me to stand outside the sliding doors in the darkening twilight and watch as she skipped and hopped trying to get it into the bag. Finally she met with success and the daughter of the off-duty cashier got to look at the butterfly fluttering in the bag filled with air, a giant slightly opaque white bubble. The mother took her daughter by the hand, and they stepped past the singing sliding doors and crossed the street to let it go in the park. I got back and found out that more of my long-term lottery tickets haven’t paid off, and I may be destitute as far as having a clue with my life next year goes. I’m homesick, but maybe I’m homesick for a place that only exists in my head. And maybe it’s a strand of blue-silver tinsel that will leave me thirsty, and I’m a butterfly that will end up lost again where it all began.